i couldn't find monthday sushi: this is birthday sushi! happy happy. Today (actually yesterday, but that was already two holidays at once ) . . . today marks a month since the inception of this blog at this address. Whee! It’s been a fantastic month so far. Thanks to each and every one of you! And special thanks to every commenter. And especial (that’s espanish) thanks to some of my favorite bloggers, tweeters, and pals, who have helped build momentum over here on the Avenue by recommending specific pieces or simply sending readers to the blog as a whole through Facebook or Twitter. If you know someone who might enjoy Church Avenue Chomp, please let them know! I’ve been leaning on social media (mostly the F word) to let you know when a new post is published, but if you like what you read, I encourage you to subscribe via email or subscribe to posts via RSS, both of which you can do in the right column. Astute question: If I subscribe via email, why don’t I get the whole post emailed to me? Wish me luck out there! 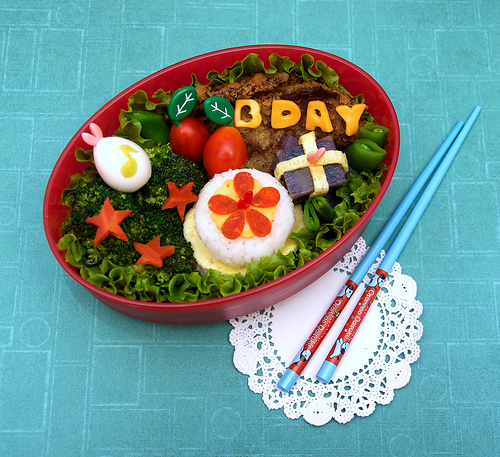 Special thanks to gamene on Flickr for Creative Commons use of this bento pic. And this isn’t even the best one! You were born to blog (and write). Happy Monthaversary!